Back due to popular demand! 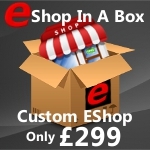 After the success of our last .COM domain registration Offer last year and for a limited time only, E Shop Hosts are offering .COM domain registration at the amazing price of Only £6.99 for the first year. The .COM domain, is considered the best top level domain extension to use and was launched in 1984, so considered as the original domain extension that is the ultimate choice to use for your web site. Internationally recognised, the .COM domain extension (TLD) and is derived from the word commercial making it the ideal choice to use on your online web shop..
Use the discount code ‘699com’ when prompted during checkout to get a .com domain registered at the Special Offer price. Most recent estimations claim that over 101 million .com domains are currently registered and actively used on the internet and that figure increases every day. Even with that many .com domain names being registered already, there are still some great names still available to be registered. Even if you are actively using a different domain extension for your website, have you considered reinforcing your brand by acquiring the .com version of your existing domain? This is good business sense as it is a known fact that web users often assume that you use the .com and type in your site name into their browser using it instead of your correct domain extension. So taking advantage of this Cheap .Com Registration Offer and buying the .Com version of your current domain and then setting it as a redirect to your existing website url makes good business sense. Use your .COM domain name for your company, web shop, blog or any other type of website. This is a fantastic price for .com domain registration, much better than the prices i am paying at my existing hosts. I just got 2 domains and will be back for more before your special offer on .com domains finishes.